On August 12, 1904, Tsar Nicholas Romanov II of Russia wrote in his diary: "A great never-to-be forgotten day when the mercy of God has visited us so clearly." That day Alexis, Nicholas's first son and heir to the Russian throne, had been born. At birth, Alexis was a large and vigorous baby with yellow curls and blue eyes, but at 6 weeks of age he began spontaneously hemorrhaging from the navel. The bleeding persisted for several days and caused great alarm. As he grew and began to walk, Alexis often stumbled and fell, as all children do. Even his small scrapes bled profusely, and minor bruises led to significant internal bleeding. It soon became clear that Alexis had hemophilia. Hemophilia results from a genetic deficiency of blood clotting. When a blood vessel is severed, a complex cascade of reactions swings into action, eventually producing a protein called fibrin. 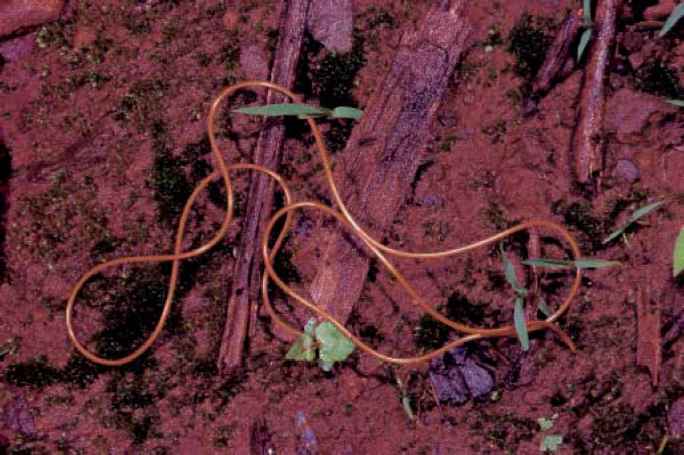 Fibrin molecules stick together to form a clot, which stems the flow of blood. Hemophilia, marked by slow clotting and excessive bleeding, is the result if any one of the factors in the clotting cascade is missing or faulty. In those with hemophilia, life-threatening blood loss can occur with minor injuries, and spontaneous bleeding into joints erodes the bone with crippling consequences. 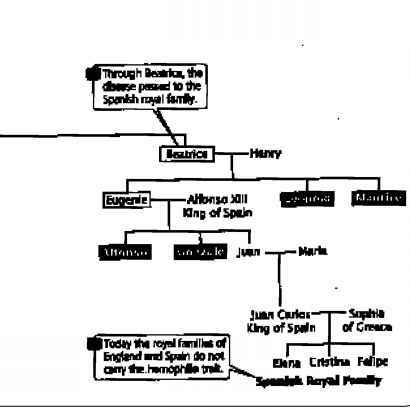 1.1 Hemophilia was passed down through the royal families of Europe. Alexis suffered from classic hemophilia, which is caused by a defective copy of a gene on the X chromosome. Females possess two X chromosomes per cell and may be unaffected carriers of the gene for hemophilia. A carrier has one normal version and one defective version of the gene; the normal version produces enough of the clotting factor to prevent hemophilia. A female exhibits hemophilia only if she inherits two defective copies of the gene, which is rare. Because males have a single X chromosome per cell, if they inherit a defective copy of the gene, they develop hemophilia. Consequently, hemophilia is more common in males than in females. Alexis inherited the hemophilia gene from his mother, Alexandra, who was a carrier. The gene appears to have originated with Queen Victoria of England (1819-1901), (< Figure 1.1). One of her sons, Leopold, had hemophilia and died at the age of 31 from brain hemorrhage following a minor fall. 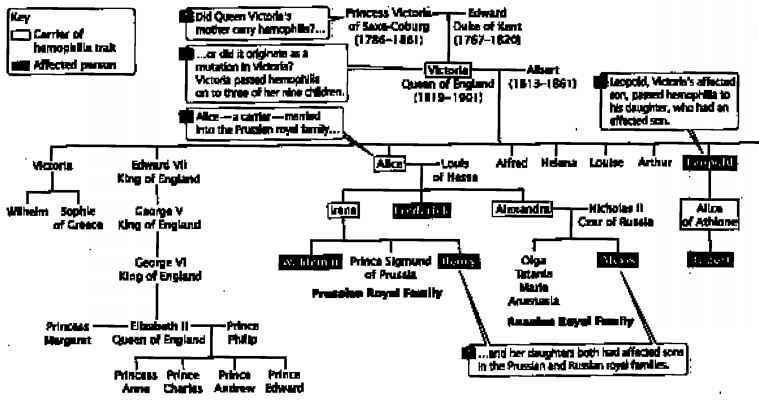 At least two of Victoria's daughters were carriers; through marriage, they spread the hemophilia gene to the royal families of Prussia, Spain, and Russia. In all, 10 of Queen Victoria's male descendants suffered from hemophilia. Six female descendants, including her granddaughter Alexandra (Alexis's mother), were carriers. Nicholas and Alexandra constantly worried about Alexis's health. Although they prohibited his participation in sports and other physical activities, cuts and scrapes were inevitable, and Alexis experienced a number of severe bleeding episodes. The royal physicians were helpless during these crises — they had no treatment that would stop the bleeding. Gregory Rasputin, a monk and self-proclaimed "miracle worker," prayed over Alexis during one bleeding crisis, after which Alexis made a remarkable recovery. Rasputin then gained considerable influence over the royal family. At this moment in history, the Russian Revolution broke out. Bolsheviks captured the tsar and his family and held them captive in the city of Ekaterinburg. On the night of July 16, 1918, a firing squad executed the royal family and their attendants, including Alexis and his four sisters. Eight days later, a protsarist army fought its way into Ekaterinburg. Although army investigators searched vigorously for the bodies of Nicholas and his family, they found only a few personal effects and a single finger. The Bolsheviks eventually won the revolution and instituted the world's first communist state. clear that a genetic defect, passed down through the royal family, contributed to the success of the Russian Revolution. More than 80 years after the tsar and his family were executed, an article in the Moscow News reported the discovery of their skeletons outside Ekaterinburg. The remains had first been located in 1979; however, because of secrecy surrounding the tsar's execution, the location of the graves was not made public until the breakup of the Soviet government in 1989. The skeletons were eventually recovered and examined by a team of forensic anthropologists, who concluded that they were indeed the remains of the tsar and his wife, three of their five children, and the family doctor, cook, maid, and footman. The bodies of Alexis and his sister Anastasia are still missing. To prove that the skeletons were those of the royal family, mitochondrial DNA (which is inherited only from the mother) was extracted from the bones and amplified with a molecular technique called the polymerase chain reaction (PCR). DNA samples from the skeletons thought to belong to Alexandra and the children were compared with DNA taken from Prince Philip of England, also a direct descendant of Queen Victoria. Analysis showed that mitochondrial DNA from Prince Philip was identical with that from these four skeletons. Romanov line. The samples matched at all but one nucleotide position: the living relatives possessed a cytosine (C) residue at this position, whereas some of the skeletal DNA possessed a thymine (T) residue and some possessed a C. This difference could be due to normal variation in the DNA; so experts concluded that the skeleton was almost certainly that of Tsar Nicholas. The finding remained controversial, however, until July 1994, when the body of Nicholas's younger brother Georgij, who died in 1899, was exhumed. Mitochondrial DNA from Georgij also contained both C and T at the controversial position, proving that the skeleton was indeed that of Tsar Nicholas. This chapter introduces you to genetics and reviews some concepts that you may have encountered briefly in a preceding biology course. We begin by considering the importance of genetics to each of us, to society at large, and to students of biology. We then turn to the history of genetics, how the field as a whole developed. The final part of the chapter reviews some fundamental terms and principles of genetics that are used throughout the book. There has never been a more exciting time to undertake the study of genetics than now. Genetics is one of the frontiers of science. Pick up almost any major newspaper or news magazine and chances are that you will see something related to genetics: the discovery of cancer-causing genes; the use of gene therapy to treat diseases; or reports of possible hereditary influences on intelligence, personality, and sexual orientation. These findings often have significant economic and ethical implications, making the study of genetics relevant, timely, and interesting. Alexis's hemophilia illustrates the important role that genetics plays in the life of an individual. A difference in one gene, of the 35,000 or so genes that each human possesses, changed Alexis's life, affected his family, and perhaps even altered history. We all possess genes that influence our lives. They affect our height and weight, our hair color and skin pigmentation. They influence our susceptibility to many diseases and disorders ( FIGURE 1.2) and even contribute to our intelligence and personality. Genes are fundamental to who and what we are.